All of my kids (except Jane of course) are back in school and I’m finally feeling like I can blog again! The skies were orange and hazy because of the forest fires when I took these pictures. The white looks off white/orange-ish! Thankfully the skies have cleared a little bit and we are having cooler weather for the firefighters. 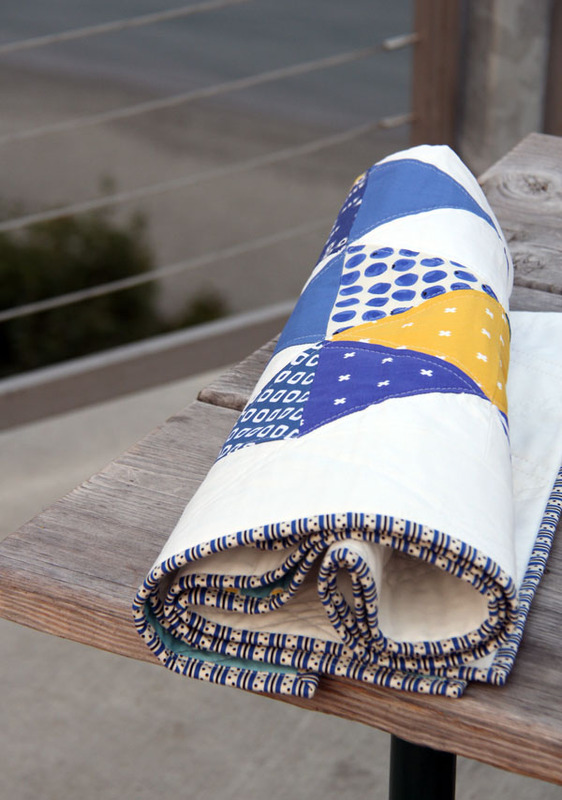 I blogged about this quilt top here, with some simple instructions for how to make it. I finished it with simple straight lines to form diamond shapes, and machine bound it with my favorite method. 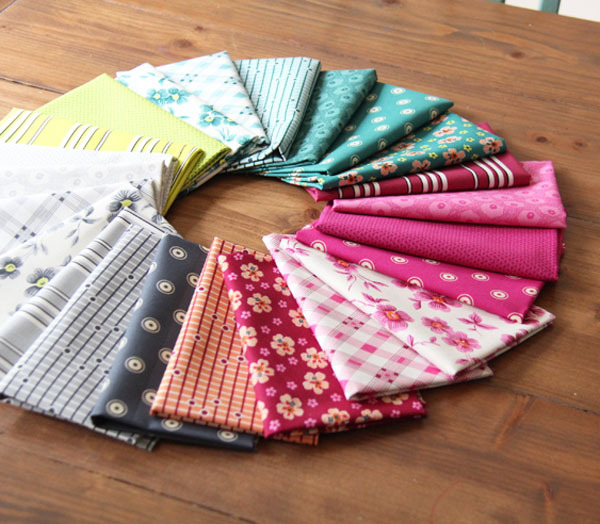 I didn’t buy fabric all summer and basically ignored my stash, but when I saw this bundle of Washington Depot by Denyse Schmidt I had to have the whole thing! I rarely like a whole collection…but this one I needed every single print (purchased here). I’m sewing with it right now! 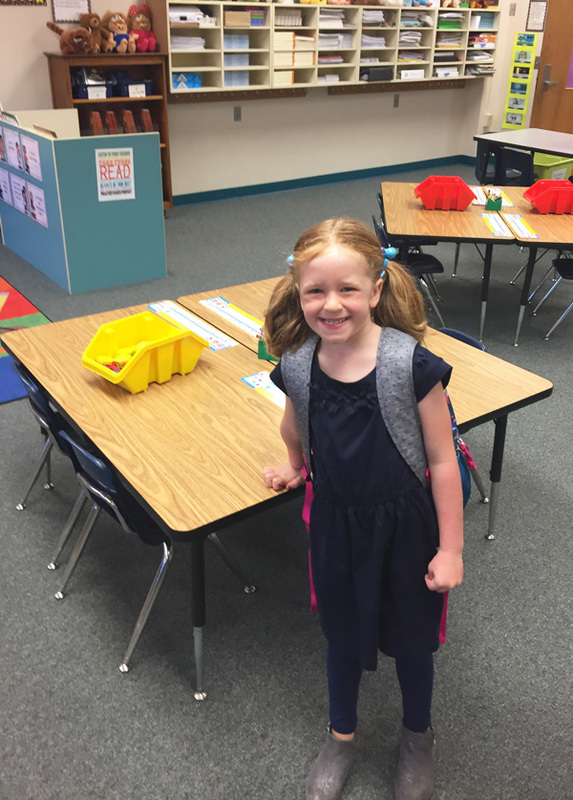 Sophie started Kindergarten yesterday….it still seems like she was born yesterday?!! Jane and I are bored without her since here Kindergarten is all day…but I’m also excited for a little more sewing time! Kids just grow so fast…. I have one about to finish… . Oh how fun! I love those little pumpkins! Beautiful quilt!! Little Sophie is so cute! She is the same age as our oldest grandchild. She too has all day Kindergarten – and a bit of a school bus ride in the morning, but the last one off after school – so an hour extra. All these new chapters! Enjoy your time with Jane! Oh that long bus ride at the end of the day is the worst! Luckily we are in the middle now…but we had that on our last route, my kids would ride the bus for almost an hour! So I had to start picking them up from school. This one is a beauty and looks as thought I can easily handle it with my narled 81-year-old hands. That sweet face on Sophie reminds me of my own little girls on their first day of school so long ago. Enjoy this little sweetheart as much as you can before she grows and is gone from under your wing as the days fly faster than you will ever realize. You could definitely handle it! It’s a simple quilt! I’m trying to remember to treasure each moment! Love the cheddar and blues. When growing up, we always passed a Morton Salt Co. mine on the way to the beach. These colors so remind me of those times! Hi Allison, I had to go over to instagram and delete my comment from yesterday – I was so surprised that Sophie was already old enough to be starting Kindergarten that I left an uninterpretable comment ! My intentions are good but my brain is mush ! I’m sure you and Jane will miss her. 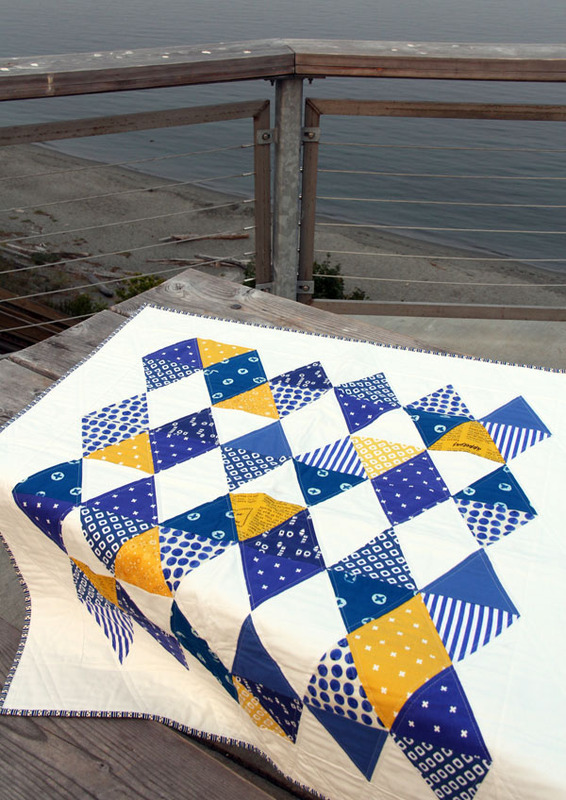 Your quilts are superb, this one is a winner also. You do such a beautiful job, they look so well done, the colors you use and fabric patterns are wonderful.. Can sure understand why you had to have Washington Depot collection, am wanting myself, gorgeous colors and patterns. If I could quilt like you I’d be so happy .My Mom was a quilter, still have couple of her quilts and some of hubs Mom’s quilts, is all we use on our bed. Have yet to start quilting as am readying for a craft show on Oct.7th. Our local Tractor Supply in Grand Junction, CO is putting show on without fee to sellers. Will be making lots of pillow covers, table runners, banners, fabric pumpkins and anything else can think of to squeeze in. Maybe some wood signs. We live few miles west of Grand Junction in rural area. When I saw the lake off your deck I was wondering if you lived off Canyon Ferry Lake in MT. We lived there few years ago and sure do wish we still lived there. When you said about the smoke from fires is why I wondered. Since we lived in MT have lived in western KY and now here in CO. If we could have what we did when we lived in MT would be back there in heart beat. We have four kids also but they’ re all grown up with grown kids of their own. Your Sophie is such a little sweetie, reminds me of our youngest first day in kindergarten. We lived in San Diego area then and she’s 47 now, ouch where do those years go? Sophie looks so excited to start school, Can imagine how you would miss her tho. How old is your little one Jane? Have great rest of week and happy quilting. Now I’d better get myself busy. Good luck at your craft show!! That is a lot of work…but it sounds like you’ve been busy preparing! I actually live outside of Seattle, WA…so that lake you saw is actually an ocean! We usually don’t get smokey skies but this year we’ve had smoke from the fires in Canada and southern Washington. My husband would move to MT in a heartbeat though…maybe someday. :) Thanks for the sweet comment! 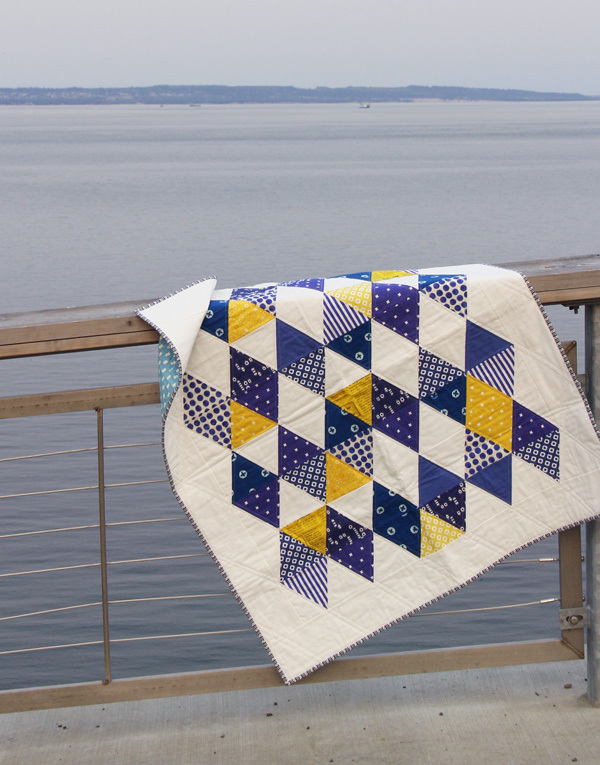 Love the colors and the pictures of the quilt! Sophie’s smile is great…hope her first day went good! What an adorable little ginger!! Lucky you. I have one, too!! If she is also left handed you will have quite a challenge! 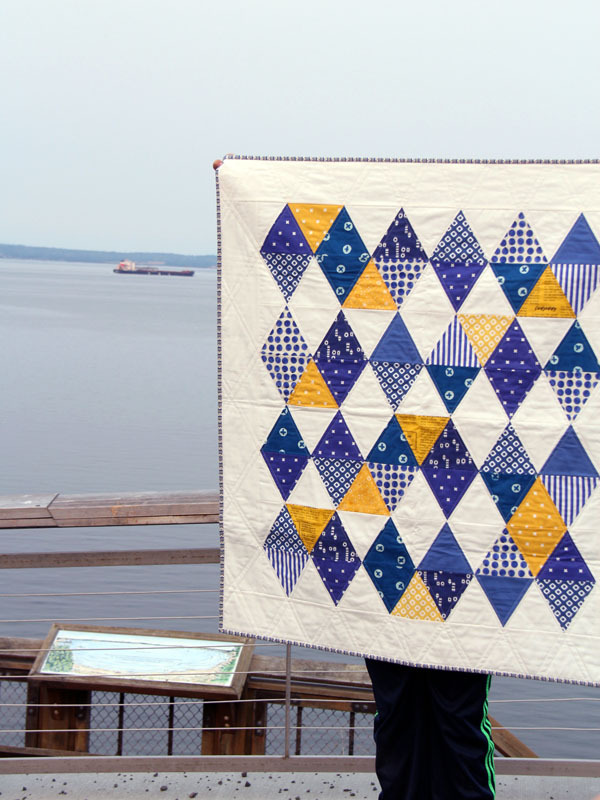 Do you sell the pattern for Indigo Triangles Baby Quilt? I am just getting back into quilting after a long hiatus! Let me know. your work is beautiful! Hi Elizabeth! I don’t, it’s just made with basic triangles, but my pattern Cascade is very similar and about the same size. Thanks!